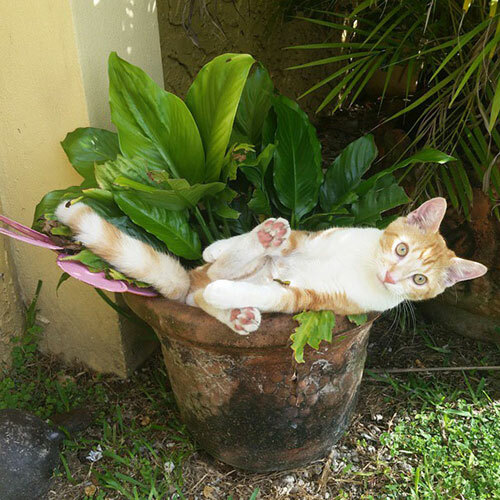 Cats are notorious potted plant-eaters. 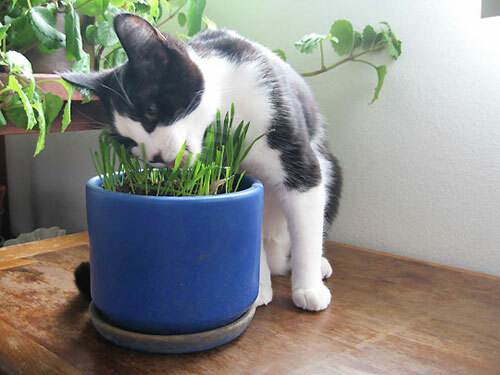 How can we indulge our love of healthy indoor greenery while responsibly keeping a pet cat? It's important that you take the necessary steps to prevent your cats from eating houseplants, not just because you don't want the plants to die, but primarily because many common houseplants are toxic to cats! Teaching your cats to avoid houseplants can be a matter of survival. 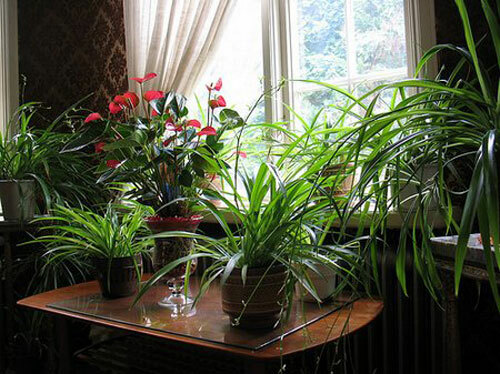 First - you need to consult a list of toxic houseplants to see if you have any in your home. 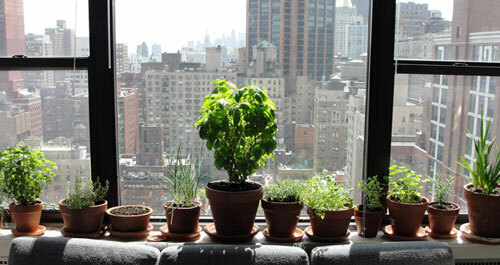 If you insist on keeping a toxic plant try hanging it or put it in an inaccessible window sill. Make sure it doesn't drop leaves where a cat can eat them. 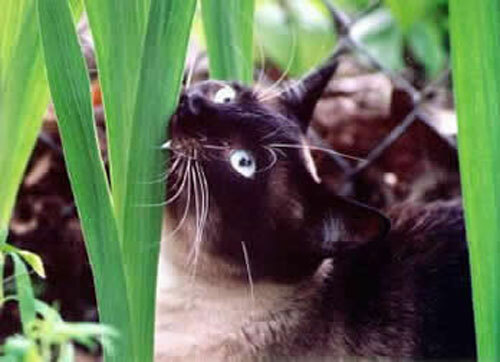 Secondly - make sure your cat's diet is sufficient and they are not lacking in fiber, vitamins etc. Next - look for ways to train your pet not to approach the plant. Try spraying with water when he goes for the plant. Unfortunately, you are not always there so you can try to make the plant smell or taste repulsive to your pet. Use both smell and taste repellents like hot sauce, chili oil and vinegar. The best part of this is the assurance that it will still work when you are not present. Lastly - make sure the problem isn't emotional. Like all of us, cats can respond to stress or emotional strain by acting out in a variety of ways. Examine the living conditions. If you detect any potential source, like other cats, new baby in the house, being neglected or lonely - try to neutralize it. Do whatever it takes! Though the disciplinary methods enjoy some success, no one really enjoys disciplining their furry friends. And besides, it hardly seems fair to spray your kitty with water if his behavior is a result of dietary needs. So buy a cat garden and spend more quality time with your cat before resorting to the unpleasant discipline actions. 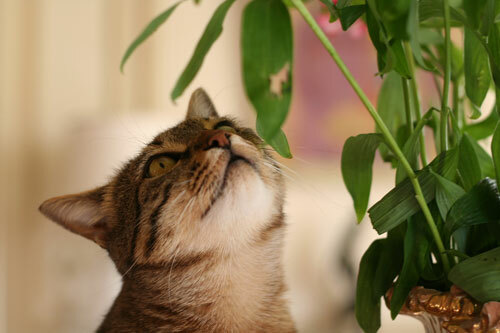 With a little thought and patience, you can figure out why your sweet pet is eating houseplants and put an end to it. Station houseplants properly, providing each plant with the recommended amount of sunlight. 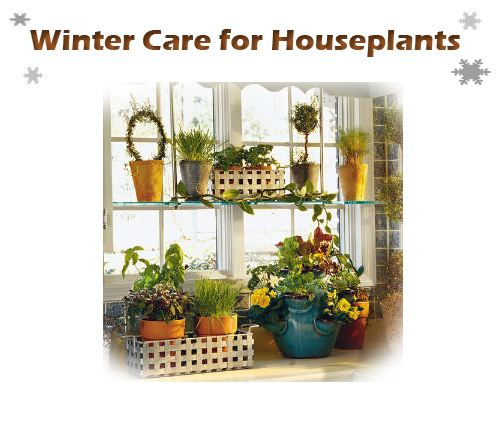 Throughout winter, water plants when the soil in each pot container becomes dry. Mist plants several times each week. Something as simple as misting really does make a big difference. Because indoor heat is extremely tough on houseplants, prevent problems by washing plant stems and foliage regularly with warm soapy water and rinsing thoroughly. If insects are present on a plant, spray the foliage with an insecticidal soap, mixing and applying the solution according to label directions. After a couple of weeks, if necessary, repeat the insecticidal treatment. Treat persistent infestations of aphids and mealy bugs by rubbing foliage with a cotton ball dipped in rubbing alcohol. Apply the treatment sparingly because alcohol is capable of damaging tender foliage. 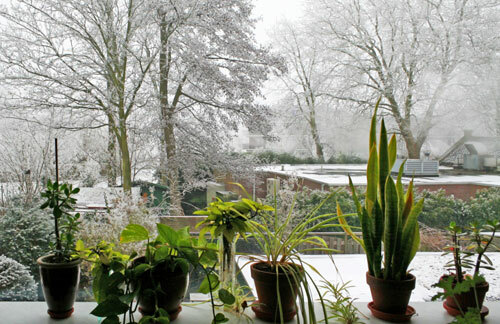 To leach salt from houseplants, select a nice day and move the houseplants outside. Flood the soil in each container until water overflows. Scrub down the outside of containers to remove the white salty residue. Before transporting houseplants back inside, remove all dried or yellowed foliage, allow all excess water to drain thoroughly, and empty all the saucers. Now is the time to check the planter for cracks. Replace any damaged unslightly containers with new fresh designs. Something as simple as a new plant container can make a huge difference in the feel of the room where you keep your plants. Of course, we recommend shopping at ArizonaPottery for all your pottery needs. The idea of shopping in winter from the comfort of your home is very inviting this time of year! With the wide selection we carry and new styles arriving all the time, you should be able to find everything you need to make your own houseplants shine. Try mixing materials like, ceramic, clay etc and find the look that fits your style. This time of year you will see exterior creations overflowing with evergreen scent and colorful bursts of the unexpected. 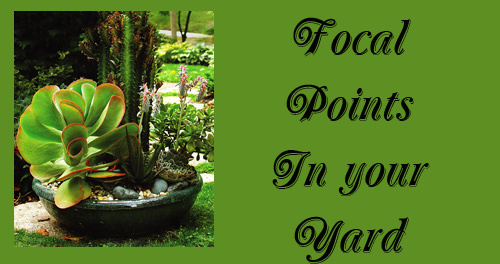 Much of the greenery found in these containers are pieces located in your yard or garden. 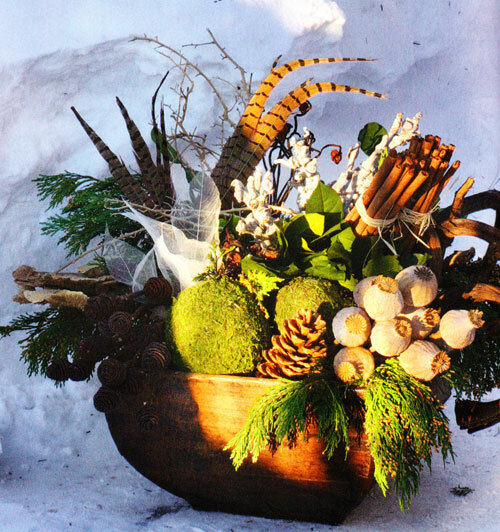 Spruce and cedar branches are tucked nicely into wet floral foam along with pine cones and berry branches. As the season progresses all you need to do is remove branches past their prime and you will still have a full arrangement left. In these containers you will see many textures abound from spruce, silver fir, Port Orford cedar, juniper and 'Stoneham gold' cedar branches accented by orange-hue eucalyptus, caspia and Southern magnolia leaves. You tend to think because it is so cold and out of blooming season why bother but as you can see, some attention to minor details can really make a huge difference. 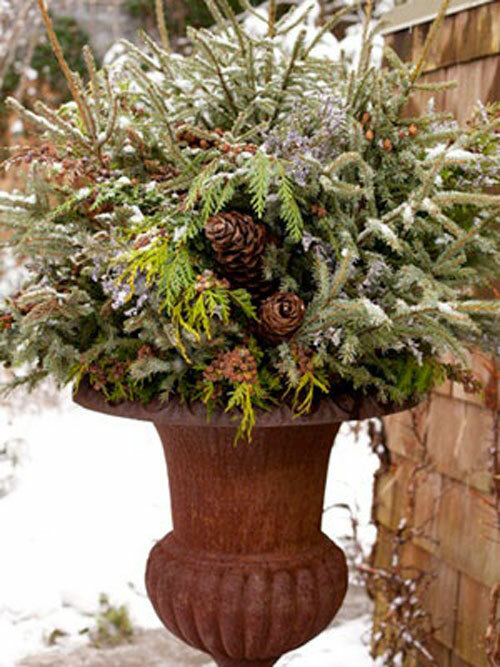 Take a potted Fraser fir, merry with dried artichokes and pear gourds, dyed eucalyptus, caspia, astilbe seed pods, dried hydrangea blooms and pine cone garland and place in a decorative planter and you have a stunning - yet simple and easy to do idea. Many of these products can be purchased in the floral department in major craft stores. Be creative and try different dried fruit and veggies along with your greens for the most interesting effects. 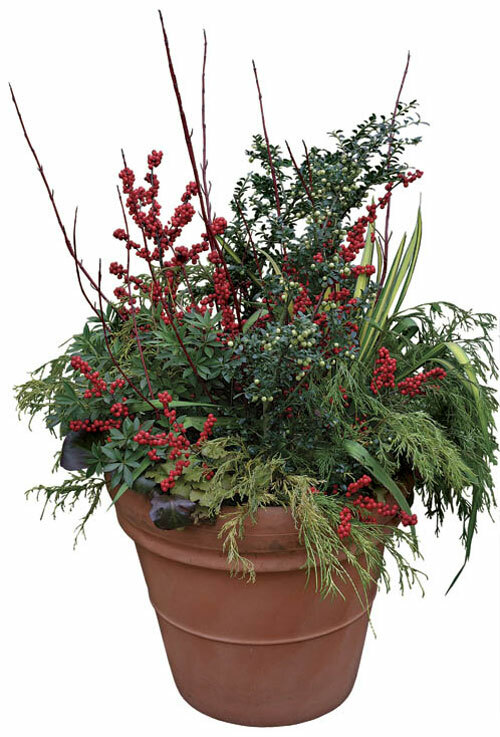 If you are expecting holiday house guests then why not place a fun container overflowing with evergreens and winter plant accents for your garden, on the front porch and provide instant hospitality and a genuine welcome. Use a vintage wheelbarrow, antique wash tub or kids sleigh. Great Tip - Though howling winds, ice and snow are formidable enemies, many arrangements can last all winter. To prevent containers from cracking as temperatures fluctuate, insert arrangements in place line pots at least 1" smaller than your container. That way if the temps hit freezing you won't crack or damage your decorative container. Coax the sweet spring-flowering bulbs into winter bloom in pebble and water filled glass bowls. Fragrant, snowy white flowers atop grass like foliage make paper whites (Narcissus)favorite indoor plants in winter. Forcing the bulbs to bloom for the holidays - ahead of their normal spring cycle - couldn't be easier. 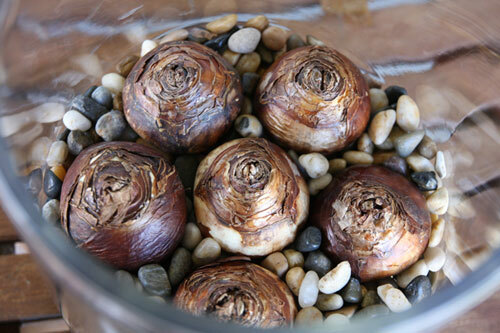 Just nestle a few bulbs among pebbles in a water filled bowl and set them in a cool place with bright daylight until buds start to swell (typically in 3 to 4 weeks). Then display them on an entry table, coffee table or dining table in clusters. Unlike some bulbs, paper whites don't require chilling, so you can force them as soon as you get them They will bloom for up to two weeks. In order to get a bloom by Christmas you should start by late November. Step 1 - Pour about 1" of pebbles into the bottom of the bowl. Set the bulbs on the pebbles, leaving about 1/4" between them. Step 2 - Add more pebbles around the bulbs to cover at least the lower two-thirds of each bulb. 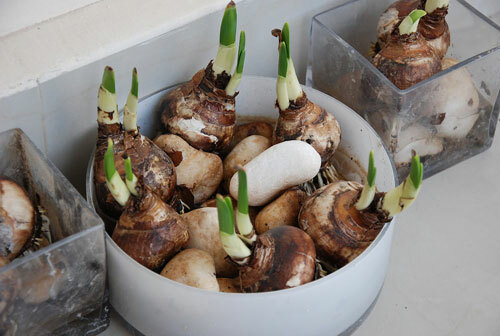 (Paper white roots are vigorous and can push bulbs out of their containers, so it's important to nestle bulbs firmly among the stone.) 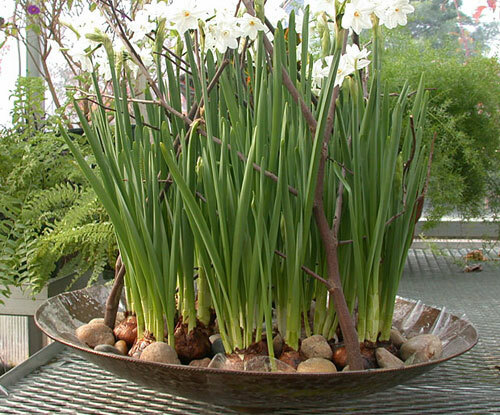 Tops of bulbs should sit just above the rim of the bowl. Step 3 - Fill the bowl with water just up to the base of the bulbs, then put it in a cool place (40 to 50 degrees at night) with bright daylight. 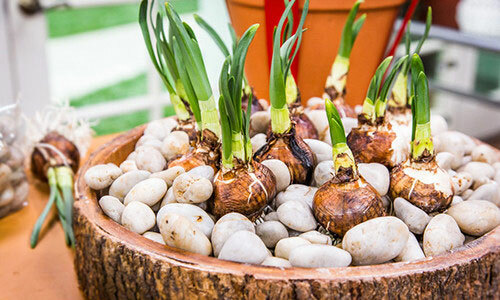 Check daily and keep water level at base of bulbs as roots and foliage grow. To minimize floppy foliage (classic paper whites grow 14 to 18 inches tall) display the blooming bulbs in a cool place (60 degrees is ideal) with bright indoor light. Another way to help keep foliage from flopping is to add alcohol to the water, using a formula developed by Cornell University researchers: After roots develop and stems have grown about 2" tall, replace the water in the bowl with a mix of 1 part 80 proof liquor (gin or vodka) to 7 parts water. Continue using the mix for the rest of the the growing season. 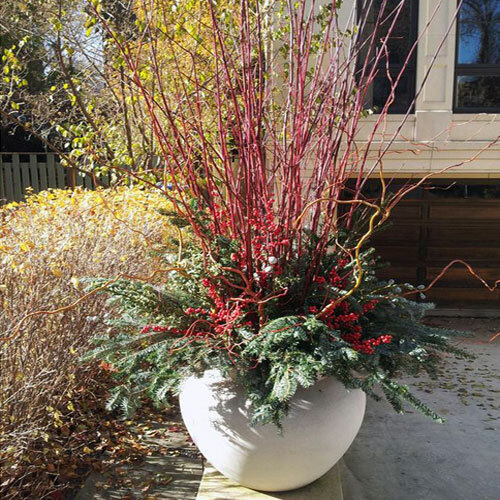 Whether it's a view, a specimen plant, or a favorite vessel you want people to notice, focal points draw attention and lead the eye from one distinct area or object to the next. They pull you in for a while before you're lead off to enjoy other parts of the landscape or, better yet, another captivating combination. Without them, your garden is absent of focus and direction. Container combinations are often the focal points in many gardens. Their artistic and architectural features act as punctuation marks to make one pause; to add emphasis; or to establish an end to a particular area, a grouping of plants, or a garden destination. Containers can bring a sense of unity to areas. Sometimes part of your landscape just needs a little extra spice. Container plantings can offer a quick fix by directing attention their way, making the sometimes lack-luster garden act as the backdrop. Get the best of both worlds with high impact, low input plants! Peacock echeveria (5) Dwarf Jade. The bowl is large and glazed with a rough texture. It is sturdy and can handle the large plants shown. The rock top-dressing really helps to keep the soil moist during the warmer months and also adds charm and texture.